- How often do you deposit or withdraw money? making withdrawals from your account? an emergency or future use? investing, or retirement planning, etc.? Here are some additional questions you may want to ask. - Are fees reduced or waived if you have other accounts at the institution? or a government payment, like a social security check? - Does the institution charge a fee for closing an account soon after it is opened? - What happens if you deposit a check written by another person, and it bounces? Are you charged a fee? or if I use choose credit for a debit transaction? 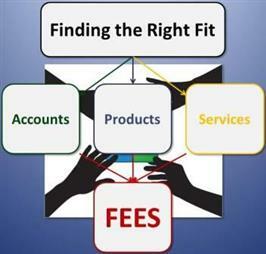 Click Finding the Right Fit and Stash Your Cash Comparison to download worksheets which will help you choose the right institution and/or account for your situation.